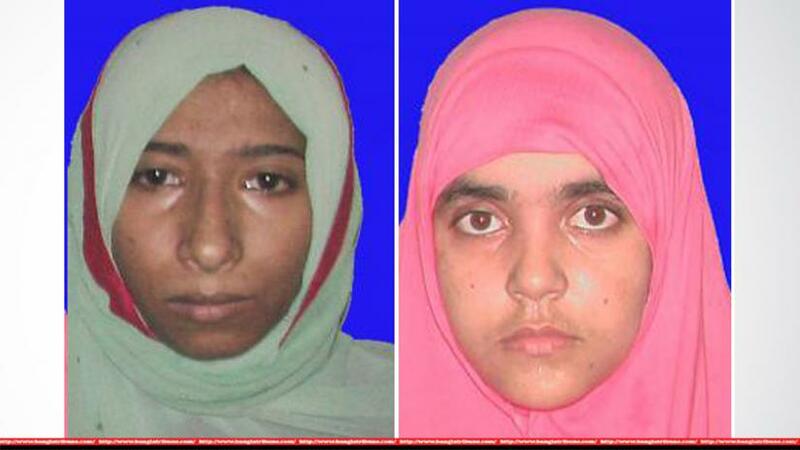 Israt Jahan Mou alias Mousumi and Khadiza Parveen alias Meghla, the two female militants who surrendered in Narshingdi, confessed to being radicalised by Aklima alias Moni. On Oct 16, Israt and Meghla surrendered following a Counter Terrorism and Transnational Crime (CTTC) raid. Moni and her husband Mostafa were killed during the raid. “Recently both women confessed to the Narshingdi district judge court, detailing how they were talked into militancy and the activities they took part in,” said Narshingdi Madhabdi police OC Abu Taher Dewan, also the investigating officer in case filed over the raid. “The investigation is ongoing and we are trying to hunt down their associates.” he added. The women were all part of the Neo-JMB’s (a revived faction of Jamaat-ul-Mujahideen Bangladesh) female wing headed by Moni. Both of them confessed that it was Aklima who talked them into joining the militant group after they enrolled at the Manarat University to study Pharmacy. “The three of us used to study as a group. We also took part in the Halaqas (Islamic gatherings) at Shahpar Aunty’s house in Dhanmondi where nearly 100 women came for the same purpose,” said Israt in her statement given to the court. “Aklima acquainted us with neo-JMB and I gradually started to believe in their causes,” it quoted her. She said that they were arrested along with another woman Istina Akter Oishee, a Dhaka Medical College graduate, on Aug 15 in 2016 during raids in Dhaka and Gazipur a month after the Gulshan café attack on Jul 1. “We were released on bail on Apr 4, 2017 after being behind bars for seven and a half months,” the statement by Israt reads. She admitted to staying home after being released until Dec 17 when she got re-admitted to Manarat University. Communications among the group was reestablished, she said before adding that they used messaging app Telegram to keep in contact. They were all part of a chat group named ‘We are…’ where they basically discussed jihad. She added that Mostafa was married to Moni while Khadiza got married to one Rakibul Islam. Israt revealed a few more nicknames that other associates used during the chat such as – ‘Jundullah Safwan’, ‘Typhoon’, ‘Alex William Gibson’. Shahnaz, a member of their group who was arrested in September this year, disclosed their names to the law enforcers, following which they went into hiding in Narshigdi, she said. Israt said that since she was the only single one in the group, she asked Khadiza’s husband Rakibul to find her a suitable groom. “He fixed my marriage with one ‘Green’, who was one of our group members,” she said and added that police raided their hideout before the marriage could take place. Khadiza Parvin, who surrendered along with Israt, cleared her HSC from Cambrian College in 2011. She later got admission at the Pharmacy department of Manarat International University where she met Moni and Israt and started to know about neo-JMB in our study group. She admitted to marrying Rakibul without the consent of her family once she was re-united with the group after being released. The Neo-JMB is trying to organize under the leadership of someone named ‘Don’, which is an organizational name, according to the counterterrorism unit. “We have identified few others of this group and we are hunting them down to nab them. There are quite a number of female members in the group,” a CTTC official told Bangla Tribune. Over the last few years the number of female militants has gone up and they have been part of many radical suicide attacks home and abroad and also went as far as Syria and Iraq to join ISIS. Several law enforcers who have worked closely with terrorism said that the young people belonging to mid and upper-mid income group have become more prone towards being radicalized.